For its age and freeware status, Armchair Quarterback is a surprisingly fun and challenging simulation, even if it is somewhat limited. One nice touch is that the game plays in real-time – you have a limited number of seconds during each match to call plays, make substitutes, etc. 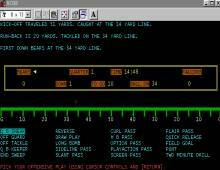 For a quick and dirty game of football management, Armchair Quarterback more than fits the bill – although it is not as detailed as commercial titles released during the same period such as NFL Challenge. Recommended!